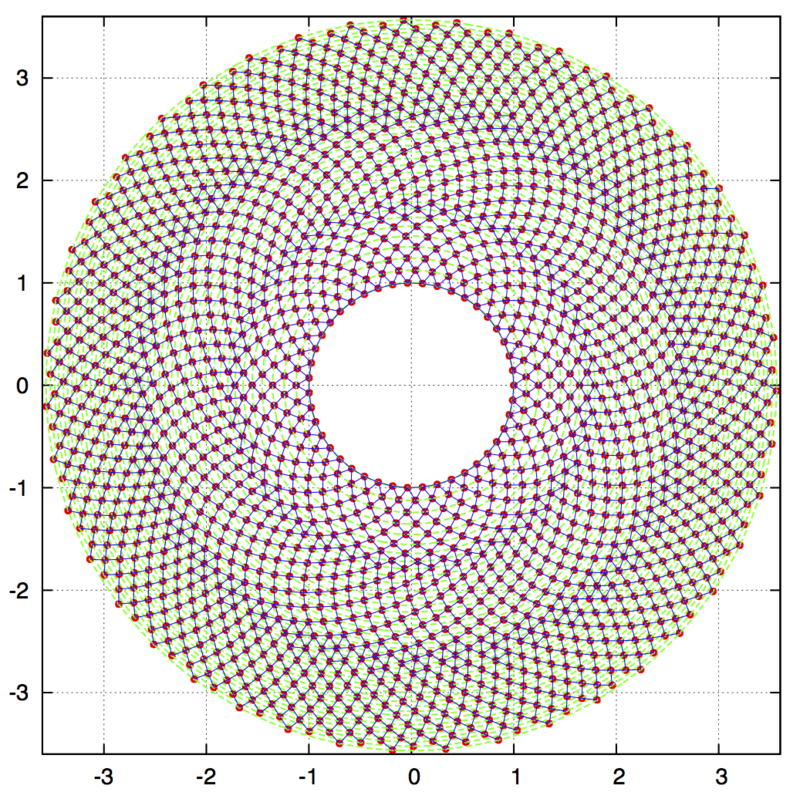 Circular Quadrature Amplitude Modulations (CQAM) were discovered in a recent work. 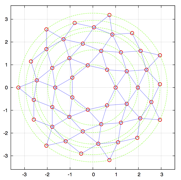 The paper was published at the 2017 IEEE International Symposium on Information Theory (ISIT) and can be downloaded here. 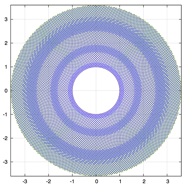 Table of circular QAM (CQAM) modulations for probabilistic amplitude shaping over the prime field Fp. 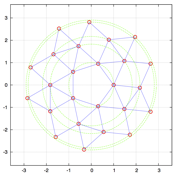 p2-CQAM constellations are given for p = 5, 7, 11, 13, 17, 43, 101. 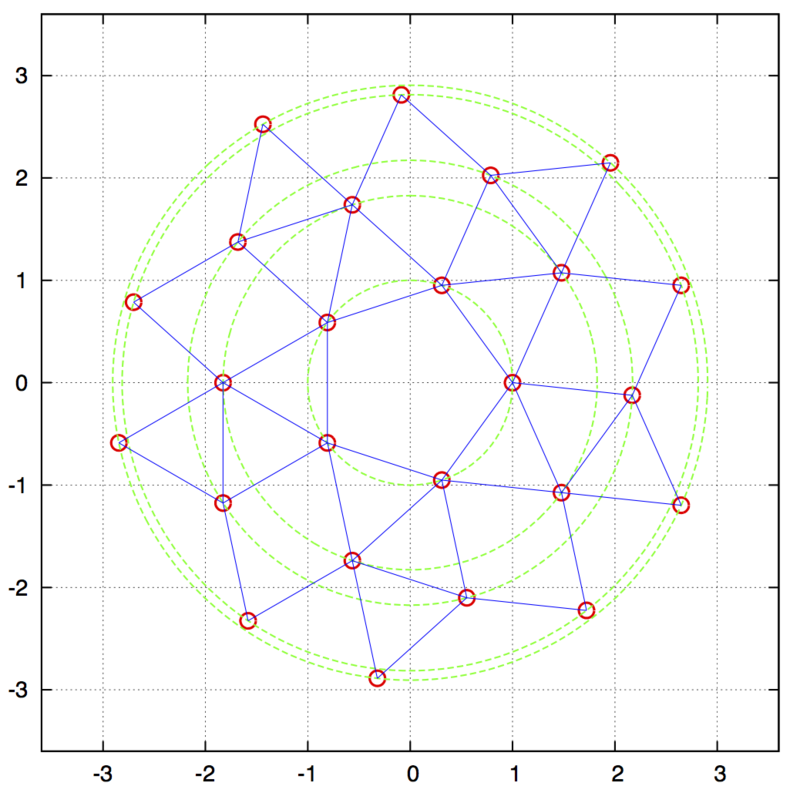 Points are drawn as small circles in red. 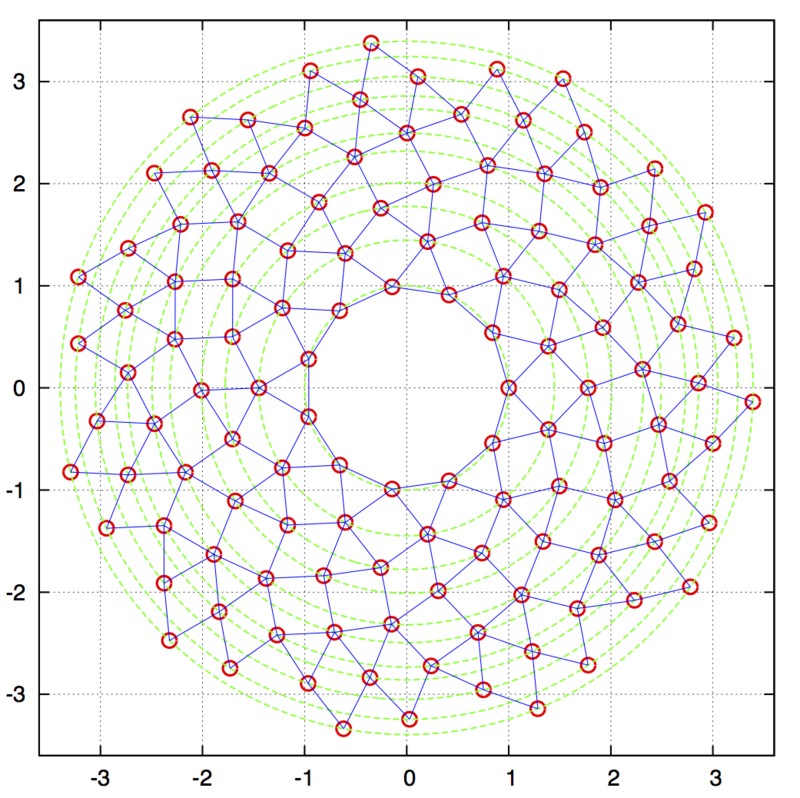 Blue segments connect points located at minimum Euclidean distance. 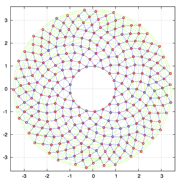 By construction, the inner radius of the p2-CQAM is ρin=1, for all p. The outer radius ρout varies slightly with p but lim p→� ρout = ρout(�) � 3.6. Open the encapsulated Postscript file for a better resolution. For p=101, zoom in the 1012-CQAM constellation. Three waves can be observed. These waves correspond to a high density (packing density) neighborhood. Indeed, define the kissing number of a point as the number of neighbors located at minium Euclidean distance. 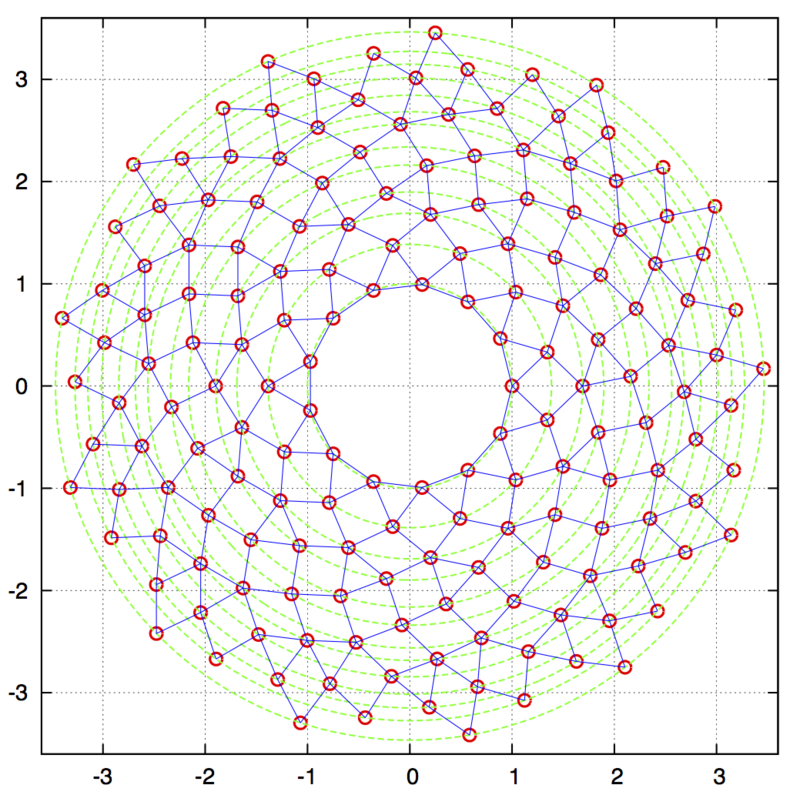 In a lattice, this number is constant and does not depend on the considered point because of the group structure. 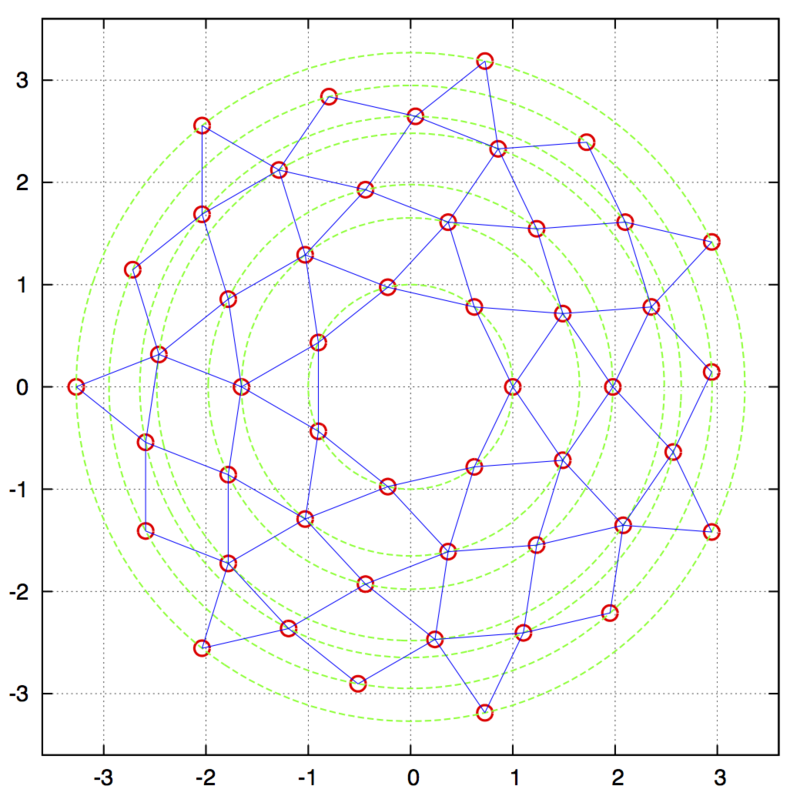 CQAM are non-lattice constellations. The kissing number may vary from one point to another. 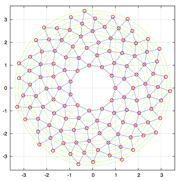 A high kissing number (the max is 6 in dimension 2) indicates a high density. You notice the three waves correspond to a kissing number of 6. Between waves, the kissing number goes down to 4. 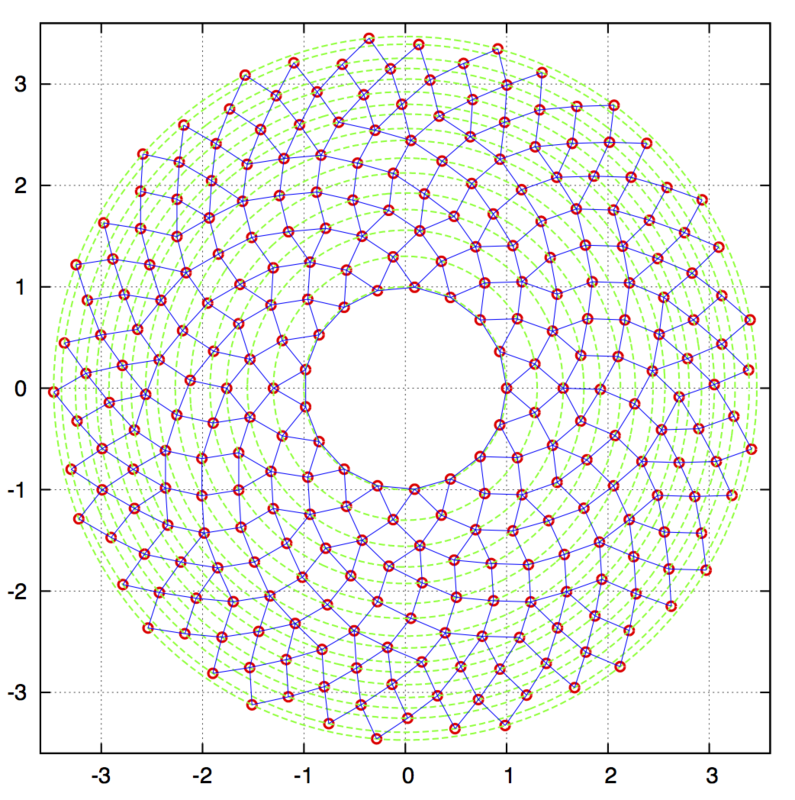 The Figure of merit is defined as the ratio of the squared minimum Euclidean distance by the average energy per point. 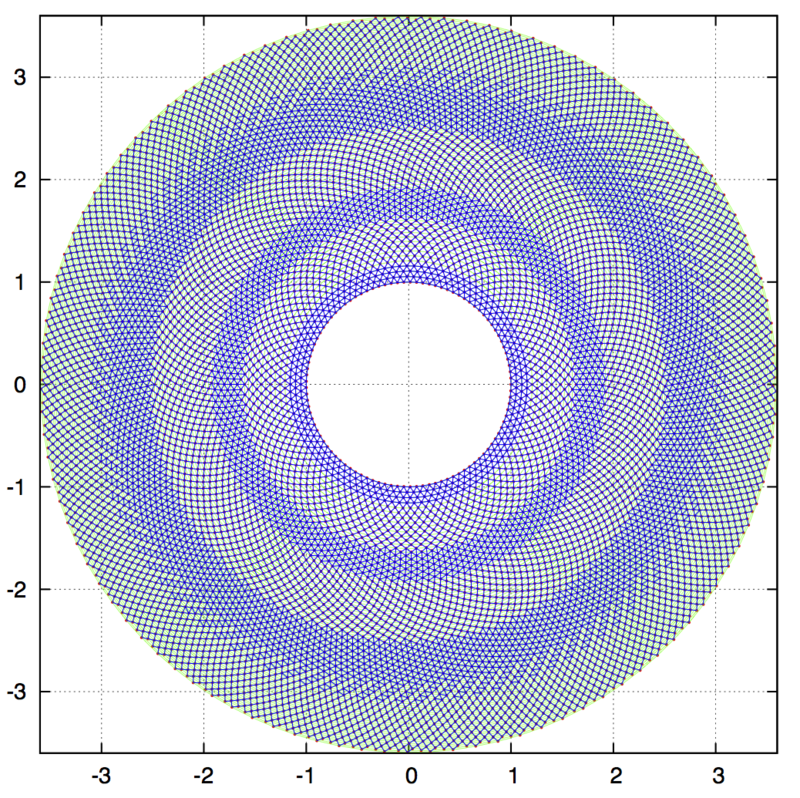 Assuming equiprobable points, for p>>1, the average energy per point is well approximated by the second order moment of the region between the unit circle and the outer circle of radius ρout(�). 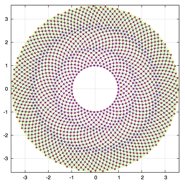 We found that the figure of merit for bi-dimensional uniform CQAM with p2 points asymptotically approaches 6.5/p2. 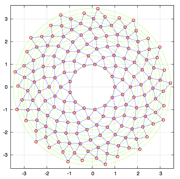 The asymptotic figure of merit for grid QAM is 6/p2. Hence, the circular symmetry of CQAM does not penalize its figure of merit. Last modification made on Summer 2017.